Hello! I hope you have had a great Summer so far. I’ve been taking life in, working with clients, finishing my certification as a Profound Wellbeing Practitioner & Transformative Coach, taking a gut health masterclass, and otherwise, being a mom. I’ve been soaking up a lot of wisdom and doing a lot reflecting; and at times, wondering when the urge to share through writing would come again. Today, I’m writing under the energy of the total solar eclipse. So far, the day has been, as promised by the mystics, all about renewal and total life reset. After a summer of being totally receptive and internal, please forgive me for the length of this post, as I’m experiencing a huge rush of inspiration today, and there is much to say. As a practitioner, I have always placed importance on the body-mind-spirit connection. As much as I love the functional nutrition aspect of my practice and am committed to continuing it and deepening my skills, I feel that even more important is working with the healing power of surrendering limiting beliefs and the thoughts that nourish them. Spiritual awakening is a big part of the work that I do with clients, because it is upstream of all things physical. While bodily self-care is important, the root of the root is what you’re tuning into/identifying with on the level of thought. After all, the behaviors that lead to core bodily imbalances have to stem from something, right? That something is belief. It’s how you are choosing to see yourself and the world, based on your past experiences. Your genetics are expressed not solely as a result of your DNA, but largely as a result of cellular interaction with your environment (epigenetics), and your thoughts and beliefs are a CONSTANT (conceivably the MOST constant) aspect of your environment. Even more so than the food you eat. It’s more on the level with the air you breath. This is scientifically backed. If you want to learn more about this, check out the work of Dr. Bruce Lipton, PhD. His book, The Biology of Belief, is a great place to start. If your only focus is to heal the body, I encourage you to connect the dots more fully. You are an eternal being having a human experience. You are not just a body. Your body is a vehicle, as well as a learning device. Your body’s symptoms are clues pointing you toward a misalignment at the level of perception/thought. Often, I see that certain belief patterns or the interpretation of trauma or stressful events, make a person vulnerable to certain disease states, accidents, infections, etc. The spiritual text, A Course in Miracles, teaches that all health and all disease begins at the level of thought. There are two sources of thought to choose from–Love or Fear, although most people are unaware of the choice, because we get triggered and too caught up in the intensity of our thinking and emotions to notice. Healing begins with making the choice to wake up to the power of thought in the moment–waking up to the nightmare you’ve been subjecting yourself to, and waking up to the fact that you can always choose again. You can choose Love instead, and when you do, it will be evident in what shows up in your body, your relationships, and in your life. Transformation requires that we wake up to the power of thought and choose to see things differently. Your thoughts are your prayer. The Universe responds to your thinking. It gives you more of what you focus your thoughts upon. Do you believe that you are worth the investment of time, energy and other resources it takes to exercise, connect regularly with friends who uplift you, eat well, avoid food triggers, detox your body and your life, have some downtime, meditate, hydrate and get good sleep? If not, you’ll make choices that block your own healing. And, the Universe will give you more circumstances and relationships that validate your belief. So will your body. They’re just responding to what you are communicating. First, at the level of thought, and then physically, as well. As you give, so you shall receive. You may intellectually believe that you are worthy of the time and energy it takes to care for your body and mind, but what do your actions say about what you truly are believing about yourself? What does your body say? Who are you? Are you just a body? Is it just your body that needs correction, or are your symptoms pointing to something deeper–a perception–that needs correction? What is your body trying to teach you? If you believe that you are a soul having a human experience, and not just a body, what is the work that you must do to fully restore peace to your body and your life? Only Love can restore peace, so what is blocking the full flow and expression of Love in your life and in your body? Where is the energy stuck? What needs to be acknowledged and released on the level of perception, so that the energy/Love can flow freely, and so that your cells get the right messaging? In summary, yes, physical root causes are real, and addressing these is an integral part of having physical relief. This is still an big part of the work that I do with clients. Going upstream of even the deepest physical root causes and addressing misperceptions and limiting beliefs, however, can definitely accelerate your healing process and make healing an ongoing, sustainable process for you. If you feel triggered by what I am saying here, I challenge you to get still and get real with yourself. How and where are you not taking full responsibility for your experience? How might you be avoiding the healing that you seek? What is the opportunity for growth being presented here (because there ALWAYS is one)? You may be tempted into judging and blaming yourself as you take that deeper look, but I assure you, attack is not the way. Be gentle with yourself. Forgive yourself for seeing imperfection and separation from The Divine where there is none. Give it to God/The Universe/The Divine, etc. Surrender and forgiveness pave the path of healing! You are here to learn and grow, and whatever difficulties you are experiencing in your life and/or body right now, are your opportunities to realize where you are choosing fear, and where you can instead, CHOOSE to realign with your limitless, Loving nature. No one can make promises about your outcome, because it’s not up to anyone but you and The Divine. You must learn to live in the present moment, where healing resides, rather than clinging to projections of the past and future. It also depends on the lessons you are needing to learn to become a fully expanded and actualized version of yourself in this life. Letting go of your attachments to outcomes, you will find, is key to the process anyway. I would love to know, what do you hear in this for yourself? If we are or are not friends on Facebook, I encourage you to join in the conversation there. Friend me, or follow me, and send me a message saying you read this post (so I know to add you). Thanks for sticking around to the end! P.S. 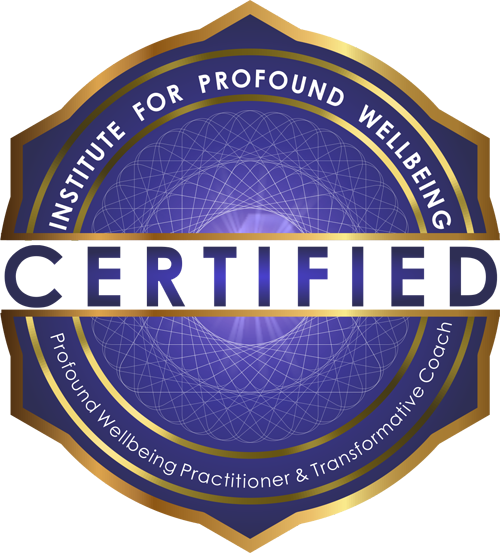 : The next round of classes for the certification as a Profound Wellbeing Pracitioner and Transformative Coach through the Institute for Profound Wellbeing begin September 18th. Enroll before September 1st to receive a $1,000 discount. Say I referred you, and get an additional $500 discount!